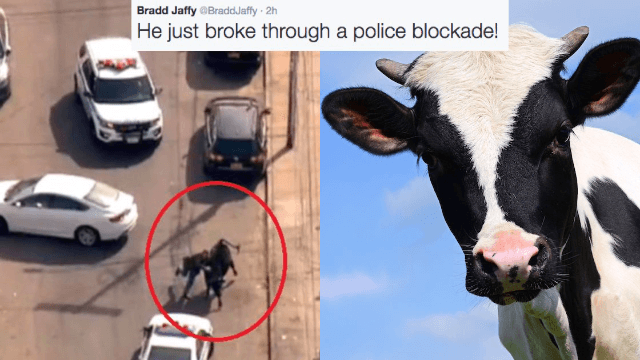 Reporter giddily live tweets high-drama NYPD 'standoff' with a loose cow on-the-run. ALERT: Just hours ago, there was a cow on-the-loose in Queens, New York. Fortunately, NBC newscaster Bradd Jaffy excitedly covered the story live on Twitter with lots of exclamation points as it unfolded. This is the most dramatic cow-chase I have ever seen and I grew up in a small town so I have seen a few. This cow is a force to be reckoned with. He even broke through a police blockade. That's when a man tried to intervene and "grab the cow." But he was no Texas cowboy, and it didn't work. By now it's becoming clear this is the Thelma and Louise of cows. "The bull appears to be tranquilized in someone's backward in Queens, surrounded by cops," Jaffy wrote. He then tweeted the bull would be collected by an "animal sanctuary," which some might see as a loss for the bull, who clearly just wants to roam free like Tom Cruise's character in Jerry McGuire. WABC just reported that an animal sanctuary is on the way to pick up the bull. HE'S GOING TO LIVE! He did it! "HE'S GOING TO LIVE! He did it!" he wrote. Still, I have a feeling this won't be the last we hear of this bull. A true rebel doesn't let one tiny capture get in between him and freedom.